THURSDAY FEBRUARY 21 (Garden City, NY) – Sophomore Monte Lambert (Brooklyn, NY/James Madison HS) scored a team-high 14 points, and sophomore Miles Haughton (Mamaroneck, NY/Mamaroneck HS) added nine points, but the Westchester Community College Men’s Basketball team fell to Nassau Community College, 70-44 on Thursday night at Nassau CC. With the loss, the Vikings are now 16-9 for the 2018-19 season. The first half was a competitive affair with Westchester falling behind late to trail 35-28 at the break, but the Lions opened up the second half on a big run, and never looked back in route to their 22nd win of the season. Also for WCC, freshman Nathan Emanuel (Suffern, NY/Suffern HS) added eight points. Westchester CC closes out the 2018-19 season on Saturday, Feb. 23 when the Vikings host UConn-Avery Point at 3:00 p.m. prior to game; five Viking sophomores to be honored for their contributions to the program. SATURDAY FEBRUARY 23 (Valhalla, NY) – Forced into a starting role after spending the entirety of the 2018-19 season playing mop-up minutes, Westchester Community College Men’s Basketball freshman Terrence Scott (White Plains, NY/White Plains HS) played more minutes (36) during Saturday’s 79-52 win over UConn-Avery Point than he did during the entire 2018-19 season combined to this point. And for almost every one of his 36 minutes, Scott was absolutely brilliant, notching career highs in points (10), assists (8), and rebounds (4) – while playing an impressive game at point guard that included terrific defense – as Westchester CC closed the 2018-19 season with a 79-52 win over UCAP. With the win, Westchester finishes the regular season with a 17-9 record. Scott was instrumental to Westchester overcoming a slow start that saw the visiting Pointers (10-20) trail 16-15 with 8:59 to play in the first half. However, from there, Westchester went on a run that included 13 consecutive points, and close the half on a 20-6 run, to take a 36-22 lead into the break. From there, Westchester opened the second half on a 15-2 tear during the first 5:01 to put the game away. Overall, Westchester went on a 41-8 run over a 14-minute stretch to close the first half and open the second half during one of the most impressive segments of play during the entire season for WCC. Scott was not the only one who enjoyed a career day. Freshman Sean Hackes (White Plains, NY/Wakefield HS) turned in his finest performance of a solid campaign, scoring a team-high 18 points – on 7 for 11 shooting – and grabbing nine rebounds. Also for Westchester, sophomore Miles Haughton (Mamaroneck, NY/Mamaroneck HS) added 15 points, six rebounds, and five assists, while Monte Lambert (Brooklyn, NY/James Madison HS) added 10 points, four rebounds, and four steals. Overall, Westchester shot 51% for the game, including a 60% effort during the second half. The Vikings also owned the boards 39-24, while forcing 25 UCAP turnovers and only committing 17. Westchester held a 39-13 edge on points off turnovers. SUNDAY FEBRUARY 24 for the first time in four years, the Westchester Community College Men’s Basketball team has earned a spot in the NJCAA Region XV Championship Tournament. The Vikings have earned the #2 seed for the playoffs, which will take place from March 2-3 at Sullivan Community College in Loch Sheldrake, New York. Westchester will open play against third-seeded Orange Community College on March 2 at 2:00 p.m. The Vikings split the season series with the Colts, losing 98-91 at Orange on Dec. 6 before defeating Orange 101-86 at home on February 7. The winner of the opening semifinal game will advance to the Region XV Championship game, where they play the winner of the other semifinal round between #4 Rockland CC and #1 Sullivan CC on Sunday, March 3 at 2:00 p.m. There is something special about wearing #3 for the Westchester Community College Men’s Basketball team. 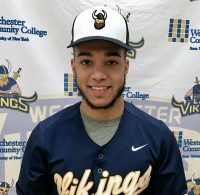 In 2018, it was Tremaine Fraiser who claimed #3 for the Vikings, and dominated his way to earning Player of the Year honors for the Mid-Hudson Conference and Region XV, after leading the Vikings in nearly every statistical category. In 2019, it is a different year, with a different person wearing #3 for Westchester CC. But, the results are the same. This time around it is sophomore Miles Haughton (Mamaroneck, NY/Mamaroneck HS) to take home both honors after a season during which he put up numbers comparable in every way to Fraiser’s heroics last season. As a result, Haughton was voted the Player of the Year for both the conference and the region. For the 2018-19 season, Haughton’s numbers were staggering. His 20.6 points per game led the Vikings, his 6.6 rebounds per game – as a guard – was third best on the team. He finished second for Westchester with 72 assists, and led the Vikings with 46 steals and 37 blocked shots. He also shot an incredible 51% from the floor, 43% from three-point range, and 77% from the free throw line. He finished in the top-three on the team in every statistical category. 12 times this season, Haughton scored at least 20 points in a game, including a season-high 41 points during a win over Dutchess Community College on Nov. 29. Only twice was he held to single digits during the 2018-19 campaign, and the Vikings won both games. Haughton also earned Mid-Hudson Conference Athlete of the Week honors on two occasions. Haughton was not the only Viking honored by the Mid-Hudson Conference and Region XV for Men’s Basketball. Freshman Joe Zayer (West Nyack, NY/Clarkstown South HS NJCAA Region XV Sportsmanship team for his character and leadership traits displayed throughout the 2018-19 season. He earned First Team All-Conference and All-Region honors after a stellar campaign during which he averaged 15.9 points per game, and led Westchester CC with 142 assists and 70 three-pointers. He also averaged 4.6 rebounds per game. Earning Second Team All-Conference and All-Region honors was sophomore Monte Lambert (Brooklyn, NY/James Madison HS). Despite missing seven consecutive games during the middle of the season due to injury, Lambert put up impressive numbers throughout the season, averaging 15.1 points and four rebounds per game, while adding 30 assists and 24 steals. SATURDAY MARCH 1 Sophomore Miles Haughton (Mamaroneck, NY/Mamaroneck HS) ended one of the most storied single seasons in the storied history of Westchester Community College history with a heroic performance. Sophomore Kevin Collado (Suffern, NY/Suffern HS) barely missed a double-double with 10 points and eight rebounds, but the second-seeded Westchester Community College Men’s Basketball team ended the 2018-19 season on Saturday with an 80-78 overtime loss to third-seeded Orange Community College in the Semifinal Round of the NJCAA Region XV Championship Tournament at Sullivan Community College. With the loss, the Vikings close the season with a 17-10 record. Neither team held a lead by more than eight points, with the largest deficit for each team coming during the first half. There were 11 ties, 22 lead changes, and both teams had many opportunities to win the game in regulation, and during the extra session. Westchester actually led for most of the overtime period, but a late Colt rally, followed by a basket with one second half in the game sent Orange to the Region XV Championship Game on Sunday, when they will face top-seeded Sullivan CC at 2:00 p.m.
Haughton was tremendous. The Mid-Hudson Conference and Region XV Player of the Year notched a double double with a game-high 28 points, to go with 12 rebounds and four steals. He shot an incredible 16 for 18 from the free throw line, and played 44 out of 45 minutes. Also for Westchetser, sophomore Kevin Collado (Brooklyn, NY/James Madison HS) added 12 points and seven rebounds, while freshman Kevin Collado (White Plains, NY/Wakefield HS) chipped in 12 points as well. Westchester struggled from the floor, shooting only 37%, compared to 45% by Orange CC, but the Vikings were the better team on the boards, at the free throw line, and they won the turnover battle as well. This was Westchester’s first post-season appearance in more than four years as the Vikings were not eligible for the Region XV Championship Tournament a year ago during their 26-0* campaign. Westchester will look to return to the playoffs during the 2019-2020 season when Westchester Community College will host the Region XV Division II Men’s and Women’s Basketball Championships. FRIDAY MARCH 1 AND SATURDAY MARCH 2 (Cheektowaga, NY) – For the second consecutive year, the Westchester Community College Men’s Bowling team finished 12th at the NJCAA National Championships after an outstanding performance during the weekend of March 2 at Airport Lanes in Cheektowaga, New York. Westchester, one of only two NJCAA Region XV teams to qualify for the National Championship competition, finished with 11,294 pins, less than 200 pins from a top-10 national finish. The National Championship was won by Iowa Central Community College. Individually, sophomore Matthew Rice (Lagrangeville, NY/Arlington HS) saved his best effort of the 2019 season for the NJCAA Championships. In singles play, he finished 23rd overall with 557 pins, only 12 pins away from a top-20 finish nationally. Rice also finished 35th in All Events with a 170.7 average. Also for Westchester, freshman Matthew Rush (Valhalla, NY/Valhalla HS) finished 38th in All Events with a 169.7 average. The doubles team of Rush and Anthony Mignone (Scarsdale, NY/John Jay HS) earned a top-20 national finish (out of 62 pairs). The duo finished in 19th place with 1043 pins. On the women’s side, freshman Brianna Kara (Shrub Oak, NY/Lakeland HS) finished in 81st place among singles bowlers with 373 pins, including a 153 during her first game. The Vikings will conclude the 2019 season at the USBC Collegiate Sectionals March 8 in Stratford NJ. THURSDAY FEBRUARY 21 (Garden City, NY) – Sophomore Jewelle McEwen (Bronx, NY/Harry S. Truman HS) scored 18 points, added six rebounds and six steals. Sophomore Shanaya Jones (Bronx, NY/Health Opportunities HS) narrowly missed her first career triple-double with 12 points, 11 rebounds, and eight assists, but the Westchester Community College Women’s Basketball team lost its third straight game, 85-56 to Nassau Community College on Thursday night at Nassau CC. With the loss, the Vikings are now 4-6 for the 2018-19 season. Facing the ninth-ranked team in the NJCAA, Westchester got off to a strong start, trailing the Lions 13-12 at the end of the first quarter. However, from there, Nassau (24-5) blew the game wide open by outscoring the Vikings 28-11 during the second quarter to take a 41-23 lead into halftime, and never looked back. For the game, Westchester shot 37% from the floor and grabbed 43 rebounds. Also for Westchester, sophomore Paige Collins (Jamaica, NY/Wadleigh HS) scored nine points, and added 11 rebounds. SATURDAY MARCH 23 (Valhalla, NY) – Five Vikings scored in double figures, and sophomore Jewelle McEwen (Bronx, NY/Harry S. Truman HS), sophomore Shanaya Jones (Bronx, NY/Health Opportunities HS), and sophomore Paige Collins (Jamaica, NY/Wadleigh HS) each had double-doubles, but the Westchester Community College Women’s Basketball team lost its 2018-19 season finale, 93-75 on Saturday at Viking Gymnasium. With the loss, the Vikings close the season with a 4-7 record. It was an up-tempo affair with both teams playing run-and-gun basketball throughout as the two teams combined for 202 shots over 40 minutes of play. UCAP (13-13) stormed out to an early 14-point lead, but a late Viking run made it 25-20 at the end of the first quarter. The second quarter proved to be even closer, but a late Pointer charge put the visitors up 40-31 at the break. The third quarter proved to be decisive as a 15-0 UCAP run gave them a brief 25-point lead, but a 10-0 WCC run made things closer. Nonetheless, UConn held a 70-52 lead heading into the fourth quarter, and never looked back. McEwen ended a fine sophomore campaign with 17 points, 15 rebounds, and 3 steals. Jones contributed 15 points, 21 rebounds, and 8 assists. Collins had 10 points, 10 rebounds, and 3 steals. Also for Westchester, sophomore Shannon Bandoo (Mount Vernon, NY/American Sign Language) chipped in 14 points, while sophomore Ambar Rincon (Yonkers, NY/Yonkers HS) had 11 points and six rebounds. Shooting woes affected Westchester throughout the game as the Vikings converted only 31% of their 106 shot attempts, while UCAP shot 39%. In addition, the Vikings grabbed a season-high 72 rebounds. Westchester now looks forward to an off-season with the intention of returning to varsity status for the 2019-2020 campaign.